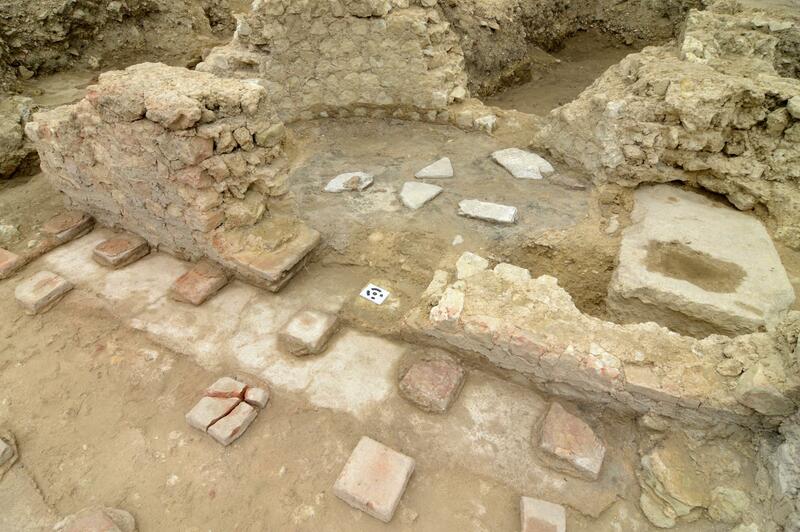 When a landowner digging a foundation for a new home on his property in Auch, southwestern France, discovered ancient architectural remains less than two feet under the surface earlier this year, he reported the find to the authorities. In April, archaeologists from France’s National Institute for Preventive Archaeological Research (INRAP) were dispatched to excavate the structure. 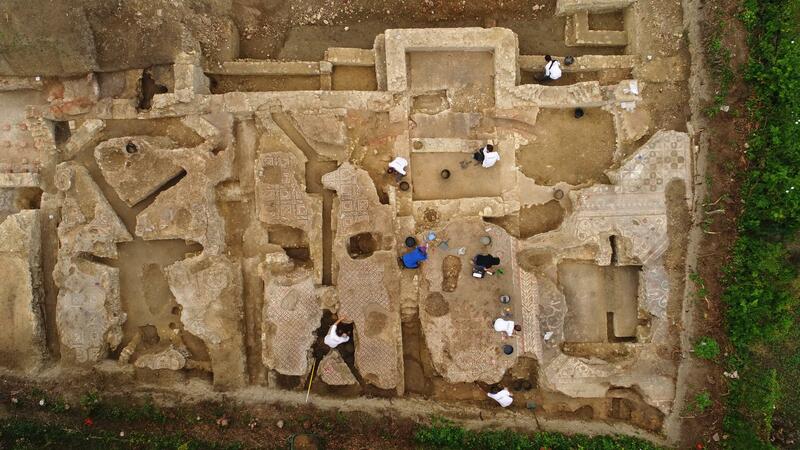 They unearthed a layer cake of Auch’s rich history, with a luxurious Roman imperial-era domus as the topper. The property is just a few hundred feet from the forum of the ancient city of Elimberris, a town founded by the Ausci, an Aquitanian tribe, before the arrival of the Romans. After the conquest of Gaul, the city’s name was Latinized to Augusta Auscorum and became one of the 12 main cities of the province that would become Gascony. It prospered in the late imperial era and the wealthy built increasingly expensive villas or expanded and upgraded existing ones. The latter is what happened to the newly discovered domus. Even when things got scary as imperial support all but disappeared in the early 5th century, Auch still seemed to be doing okay. It was made the capital after the Gascon city of Eauze was razed by the Vandals, in 409 A.D., but these were the twilight days of the Roman Empire and being the regional capital of a place where the elite had already beaten a hasty retreated and abandoned their fancy villas years, perhaps decades, earlier, was a dubious distinction. The fancy villas were stripped for building supplies and otherwise forgotten. 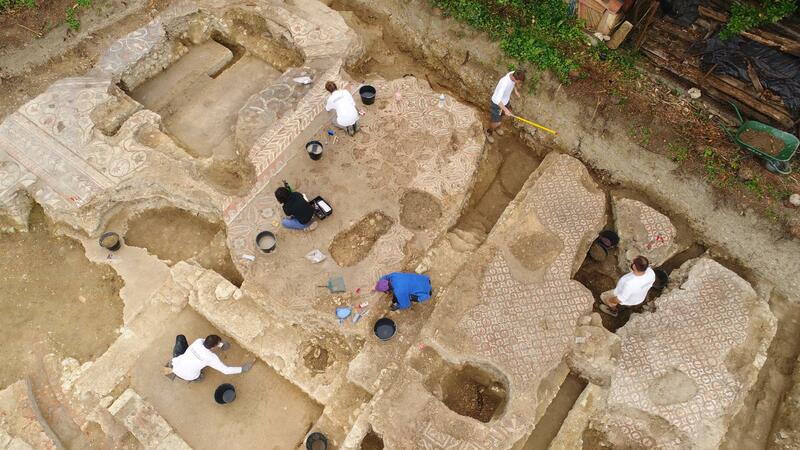 Very little of ancient Auch has been excavated. Most of the archaeological material we have from Gallo-Roman Auch comes from a single major excavation years ago and scattered finds here and there. This discovery has been an exceptional boon to archaeologists because on this one 800 square meter site, they found evidence of the earliest settlements dating to the second half of the 1st century B.C. through the Late Empire. Its first iteration was comparatively modest. It was private home with earthen walls. In the 1st century A.D., the site shows signs of an acceleration of urbanization under Rome’s influence. The city grew on an organized grid system orientated by the cardinal points of the map. The forum was built in this period, as were a number of top quality private dwellings. The villa was built in the 3rd century and was significantly expanded and altered twice after that. 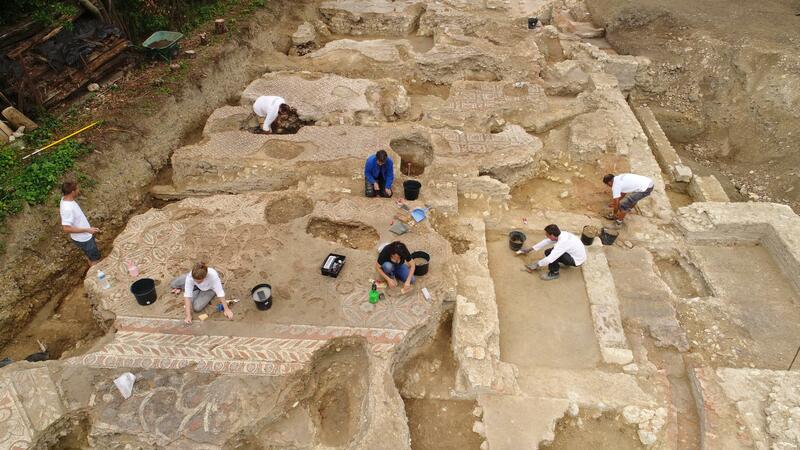 In was in the early 4th century A.D. that the domus got its greatest refurbishment. Some time around 330 A.D., baths were added to the home. A home bath complex was the mark of high luxury. The baths in this villa were in their own building about 100 feet long and 30 feet wide. 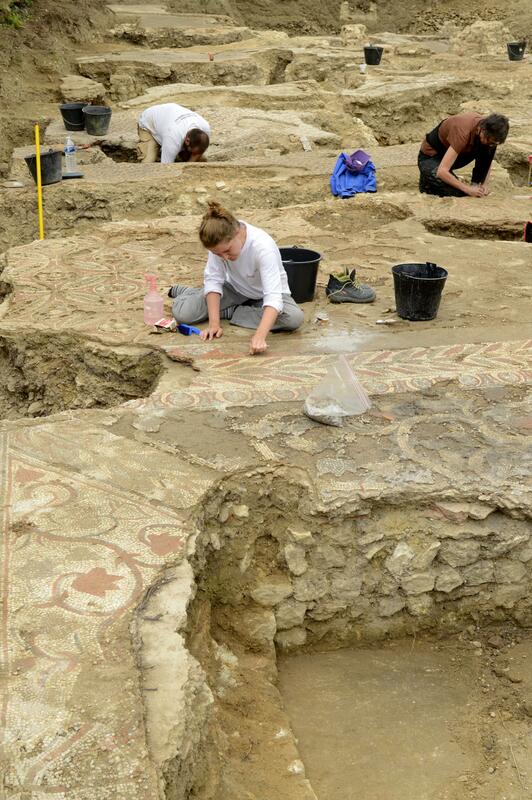 There were at least three rooms heated by underfloor hypocausts and the floors were decorated with brightly colored mosaics in a variety of patterns including geometrics (octagons and squares, waves), florals (ivy, laurel and acanthus leaves), tridents, braids and more. 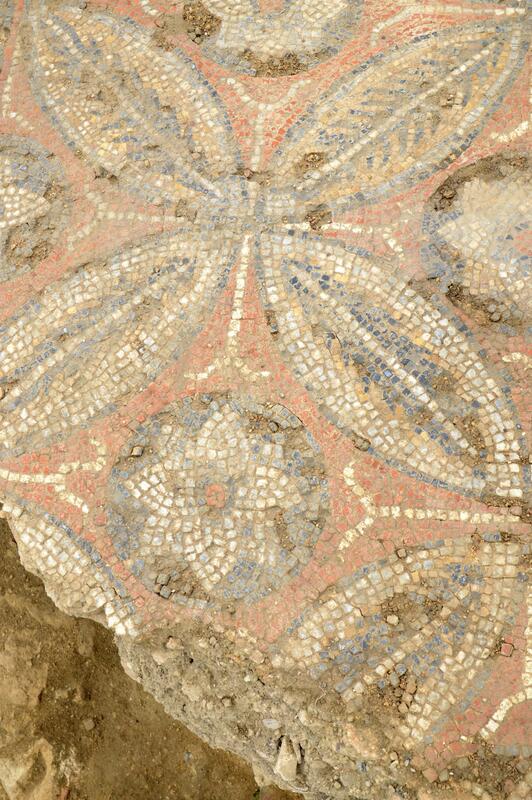 While none are extant in their original form, mosaics also decorated the walls. 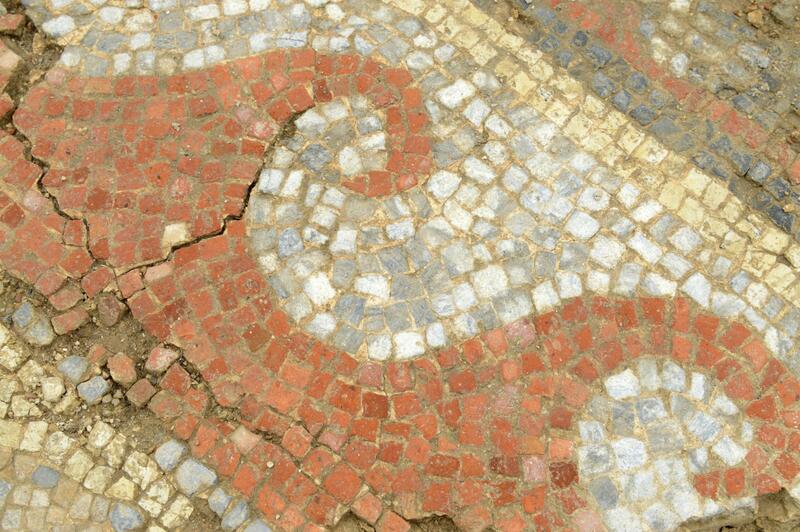 Archaeologists found black, green and red glass tile fragments amidst the floor rubble; that’s all that’s left of the colorful wall mosaics. The mosaics are designed in a style characteristic of the area in the late Empire. The Aquitanian style is well known in ancient country villas from this era, but this domus stands out because it was a city home, not a rural estate. Aquitanian style mosaics are far rarer in urban centers, although they have been found before in Bordeaux and Eauze. It seems the domus endured the same fate as other elite homes did in this region. It was left to its own devices at the end of the 4th century or beginning of the 5th century, and locals salvaged whatever materials from it they could use. The walls were demolished and their stone taken, the marble floors pulled up, even the stacks of tiles used to raise the subfloor for the hypocaust heating system were taken. 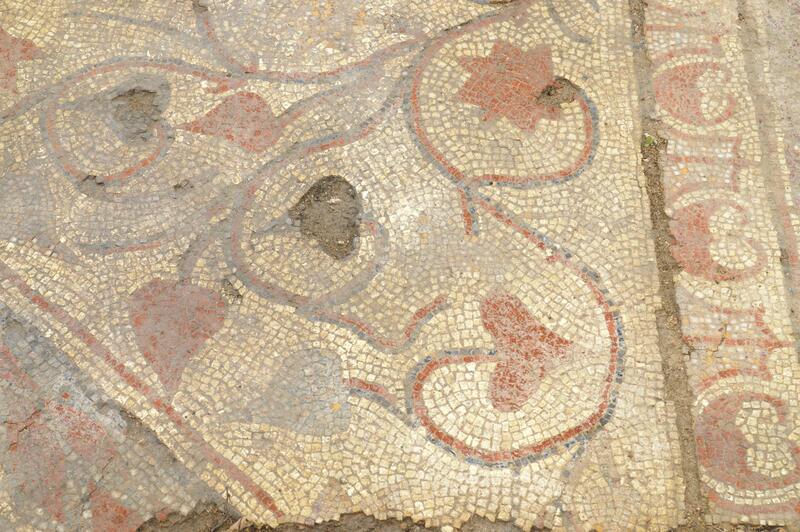 The mosaics that weren’t destroyed by the process were damaged. The ruins were quickly forgotten and covered with earth, albeit a remarkable thin layer considering it took more than 1600 years for anybody to find what was left of the domus. INRAP is working at lightning speed to excavate and recover as much of the site as they can. They plan to lift the whole mosaic floors. What will happen to the rest of the remains is unclear. The property owner wants them out by September so he can go back to building his thing, invaluable archaeological treasure be damned. Anything left behind could well be destroyed. This entry was posted on Sunday, July 16th, 2017 at 11:50 PM	and is filed under Ancient. You can follow any responses to this entry through the RSS 2.0 feed. You can skip to the end and leave a response. Pinging is currently not allowed. Too bad the land couldn’t be purchased and saved somehow. It’s such a valuable find. If I was the landowner, I would attempt to rebuild/recreate the original Roman building. Nothing modern can compare to that. Auch… is that near the castle Arrrrrrrrrrrrrrggghhh?